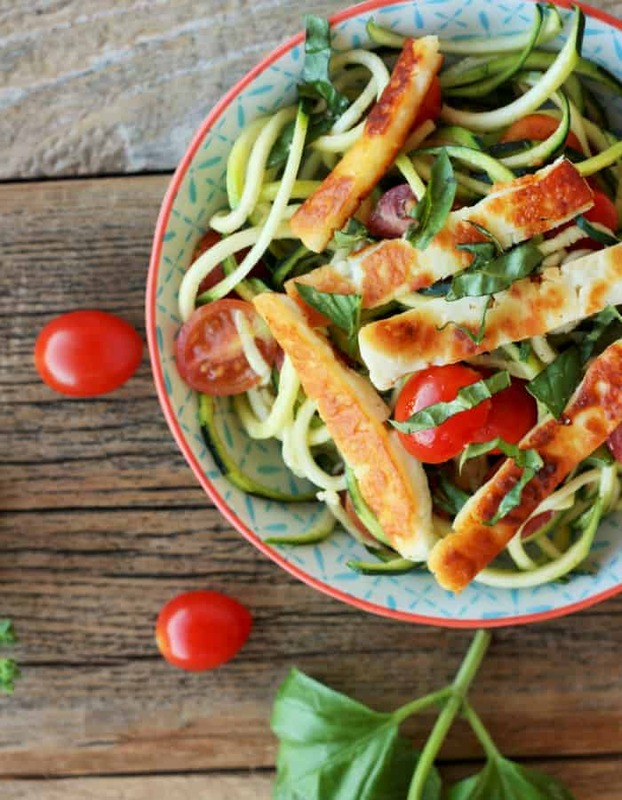 A crispy one-pan dinner, Fried Halloumi With Bruschetta Zoodles is a delicious weeknight dinner. Keto, vegetarian, and kid-friendly, this dish is versatile and simple. Oh, my friends, you’re going to love this dish! It’s a one-pan meal that takes 15 minutes from start to finish. You’re about to freaking rock your Meatless Monday. When my youngest was a baby I had to quit dairy cold-turkey when we found out he had big issues with cow’s milk. Dairy was my life and cutting it out was painful. Especially when on day one we went to a birthday party that had ice cream cake. Ice cream cake is the only cake I like people! 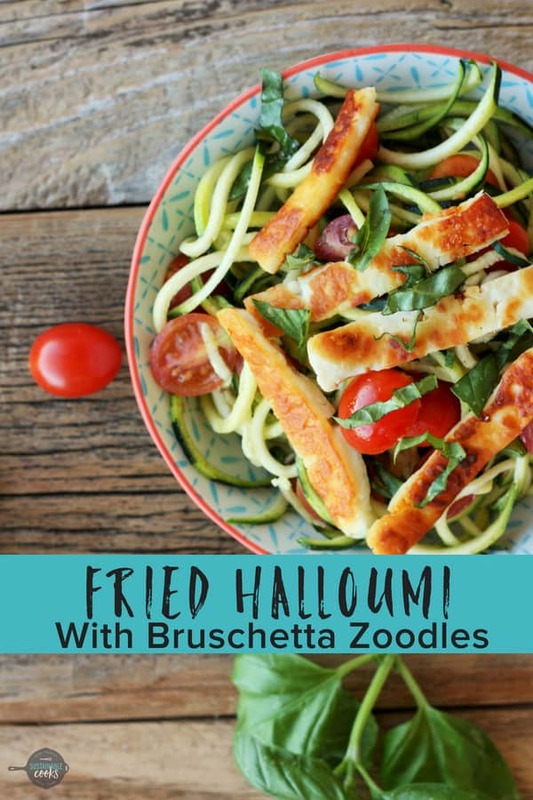 I was thrilled to find that he could tolerate goat and sheep’s milk products and that led me to discover the goodness that is Halloumi. Halloumi is a sheep’s milk cheese from Cyprus, though do check labels because some brands also include cow’s milk. Halloumi has an awesome flavor like if feta and mozzarella had a baby and then dipped that baby in the tears of a unicorn angel. The taste is hard to describe but we call it the “squeaky cheese”. If you’ve had queso blanco then the texture will be somewhat familiar. Wanna know the best part? Yeah, you do…you can grill it and fry it! Legit people this stuff is the ish. Yes! And it is a vegetarian staple especially in Europe where it is an easier cheese to find. At a whopping 16.7 grams of protein per serving, Halloumi can be a delicious part of a vegetarian or Keto lifestyle. Can You Eat Halloumi Cheese Raw? You sure can and you should because it’s so good. While it holds up amazingly well to high heat, it is also super tasty eaten raw in salads or a cheese plate. I may have snacked on an obscene amount while photographing this recipe. 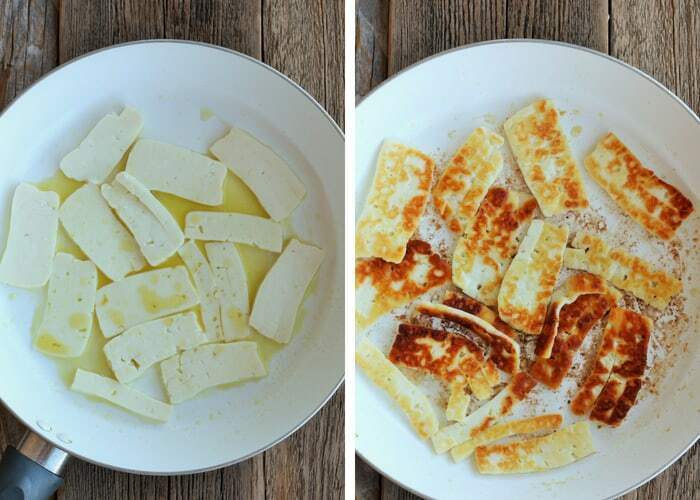 Can You Fry Halloumi Cheese? Halloumi cheese was born to be fried. It is its life purpose. When it was born it read The Secret and then immediately put it out there that it wanted to be flash fried in a pan with a bit of olive oil. I heard that wish and did exactly what needed to be done. And now everyone is happy. 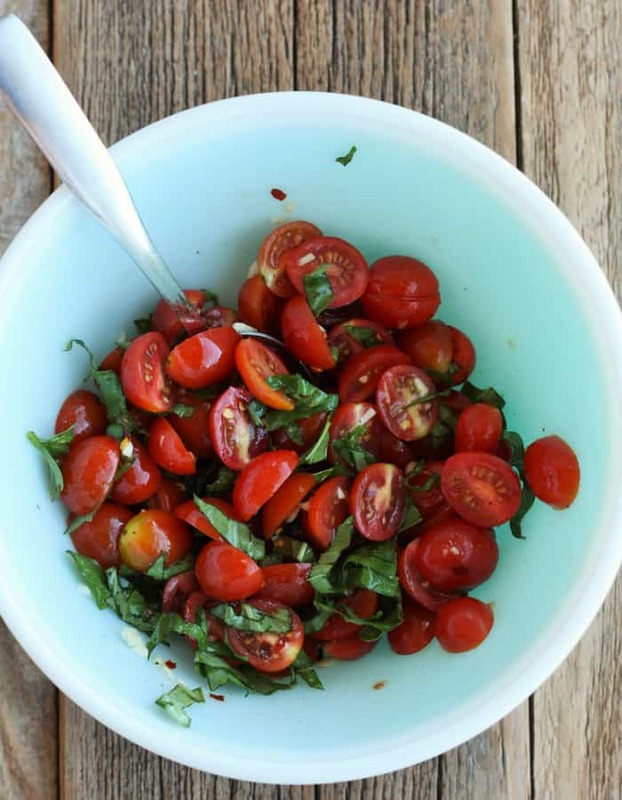 Mix up the tomatoes, garlic, truffle oil, basil, red pepper flakes, and pepper. Set aside. Heat 2 tbsp olive oil over medium-high heat. Add your halloumi and let it get nice and brown (about 3-5 minutes), then flip and cook for another 1-3 minutes. Remove from pan. 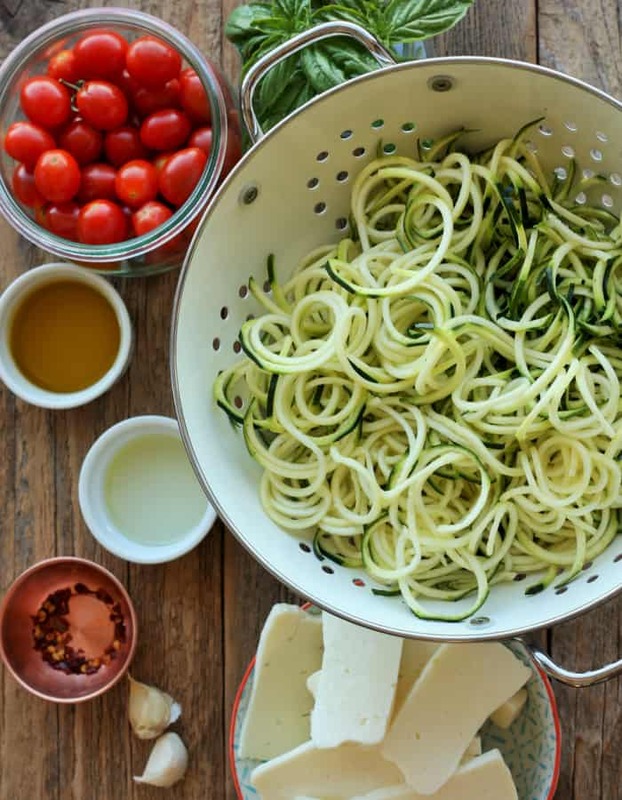 If there is any leftover olive oil in the pan toss the zoodles in there for a minute. Dry pan? Drizzle a teeny bit of oil in there before adding the zoodles. 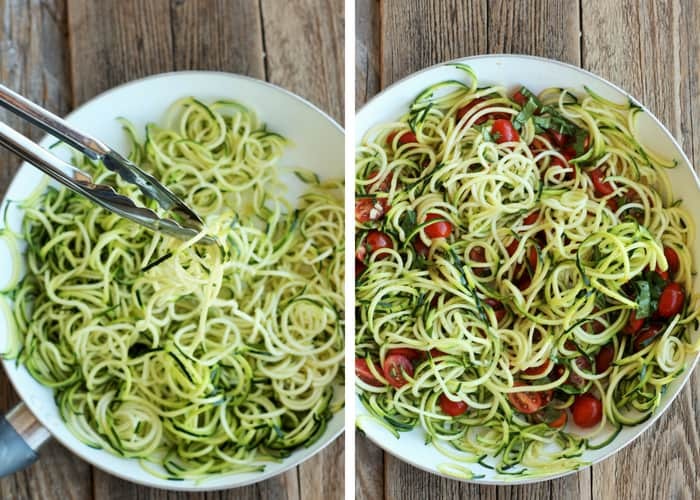 Add the tomatoes to the zoodles and cook for a few minutes until they have softened. 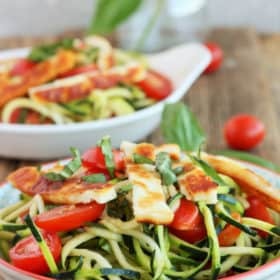 Top with Halloumi and fresh basil and serve! Halloumi can be a trickier cheese to find in the states. Keep looking because it is worth it. I bought mine at Trader Joes. Halloumi on its own is pretty salty so you’ll notice I didn’t add any additional salt to this recipe. Taste and season according to your preferences. You can rinse halloumi and pat it dry to reduce some of the saltiness. Truffle oil is an amazing ingredient that I use with potato recipes like Air Fryer French Fries and Home Fries. A little goes a long way and the flavor it adds to food is fabulous. If you don’t have any or don’t want to use it, increase the amount of olive oil by 1 tbsp. I used grape tomatoes sliced in half for this recipe. Any solid tomato (paste or San Marzano-style) would work great. 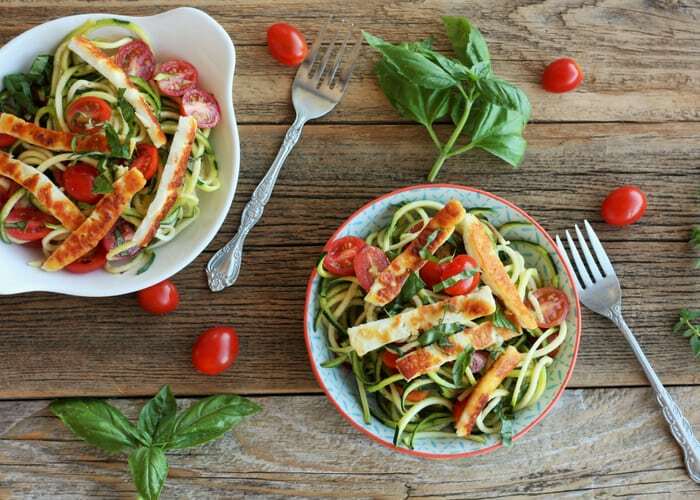 A crispy one-pan dinner, Fried Halloumi With Bruschetta Zoodles is a delicious weeknight dinner. 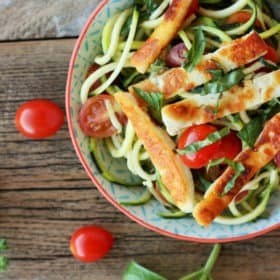 Keto, vegetarian, and kid-friendly, this dish is so versatile. Halloumi on its own is pretty salty so you'll notice I didn't add any additional salt to this recipe. Taste and season according to your preferences. You can rinse halloumi and pat it dry to reduce some of the saltiness. If you don't have any truffle oil or don't want to use it, increase the amount of olive oil by 1 tbsp. Halloumi AND truffle oil?!?! These are two of my favorite things! This looks amazing and like I want it right now. We have the same love language Christine. I just bought some Halloumi cheese at TJ’s. Now, I want to make this! Just need to reduce the carbs to 7, what I follow on my low carb plan. Less veggies and more fat, I think. Thanks. I wonder if reducing the amount of tomatoes would make the most impact? I made this for dinner last night, without truffle oil cause thats out of my budget, but holy crap it was sooo delicious. Where has halloumi cheese been all my life?? It’s like a grilled cheese without bread. I’m afraid my husband & I ended up eating the whole package of cheese as the kiddo wasn’t a fan (we are still not sure what planet she is from) Can you trust people who don’t eat cheese? Anyway, thanks again for another awesome recipe! I love, love, LOVE that you called it grilled cheese without bread. Such an interesting and yummy cheese, right? 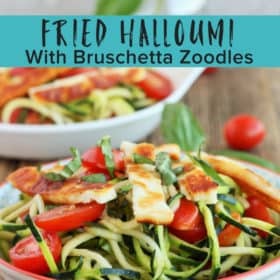 I’m glad you have Halloumi in your life now! And I agree people who don’t like cheese get a side eye from me.